The Old Irving Park Beer & BBQ Challenge Is Back! Come join us for the 5th Annual Old Irving Park Beer & BBQ Challenge! You get 22 BBQ samples + 44 craft beer tastings to vote on. Plus, get some refreshing cold brew coffee and gourmet ice cream. Click here to see the line up. St. Viator Parking Lot • 3644 N. Kedvale Avenue. 100% of the proceeds benefit of St. Viator School & Parish programs and facilities. Come join us for the 4th Annual Old Irving Park Beer & BBQ Challenge! You get 20 BBQ samples + 40 craft beer tastings to vote on. Click here to see the line up. The event raises funds for the benefit of St. Viator School & Parish programs and facilities. St. Viator goes to Washington D.C.
St. Viator’s seventh grade students, Aaliyah Navarro, Emma Jones, and Amlin Osiecki are among the many students who had the honor of being invited to participate in the Junior National Young Leader Conference in Washington D.C. These students, and others from all over the country, were nominated for their academic achievements and leadership abilities. They will spend a week in our nation’s capital where it will serve as their living classroom providing amazing experiences related to personal leadership, future goals, and finally, global and community service. They are particularly excited about their sleep over at the Smithsonian National Museum of American History. We are very proud of our St. Viatorians!!!! Skate, Sip & Shop at Winterfest! The weekend of holiday activities included ice skating, Christmas trees and wreaths, holiday movies, shopping with vendors, bounce house, meals and snacks, hot chocolate, cookie decorating, and visiting with Santa. There are 786 pictures so far posted. We hope you find one good enough for the Christmas family holiday card. We will keep you posted about next year very soon. CURRENT & PROSPECTIVE FAMILIES: Come see our students shine as the school halls are transformed into an art gallery displaying the work they've completed in the Art Zone program. You can also visit our classrooms where students' academic work is proudly on display. Teachers will be present to answer any questions you may have, and we'll be hosting a reception in the school hall. 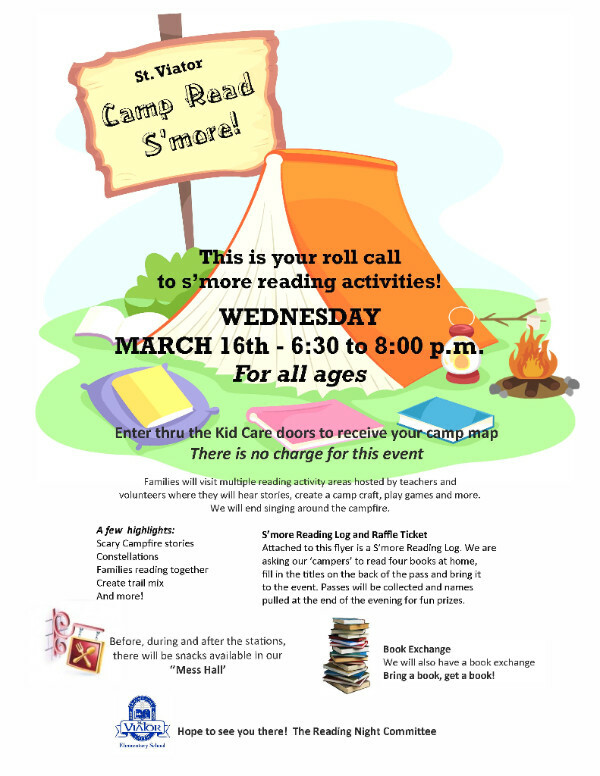 Join Us for "Camp Read S'more"
We are hosting a camping-themed Reading Night, St. Viator Camp Read S'more, on March 16 at 6:30-8:30 p.m. Families will visit multiple reading activity areas hosted by teachers and volunteers where they will hear stories, make a craft, look at the constellations, play games and more. The evening will conclude with singing around the campfire. Students, don't forget to bring your completed reading logs to enter the raffle. For more details, see the flyer. We're hosting special events every day this week in honor of Catholic Schools Week. The National Junior Honor Society Induction ceremony took place on Monday, the Superintendent of the Archdiocese of Chicago Catholic Schools, Dr. Jim Rigg, visited and teachers enjoyed an appreciation lunch on Tuesday, and the PeaceBuilder's Talent Show (pictured) and the "Power of Play" parent speaker were today. To wind up the week, all parents who new to St. Viator this school year are invited for a continental breakfast on Friday at 7:50 a.m.
A longstanding tradition at St. Viator, National Catholic Schools Week takes place this year from January 31 through February 1. A Catholic education develops and nurtures the students' faith in their family, their community and themselves. St. Viator provides an education that fosters self-esteem, promotes self-growth and academically prepares children for a future of success. During this week, we celebrate the dedication, enthusiasm and commitment of our teachers and parents as well as the success of our children. Please join us for the Catholic Schools Week Open House for current and prospective families on Saturday, January 30, 2-4:30 p.m. We'll provide tours of the school and gym, and faculty, staff and parents will be available to answer your questions. After the Open House, we hope you'll attend 5 p.m. mass to celebrate the beginning of Catholic Schools Week.